If you work for a living you need to know this. Someone’s been asking questions about you – a lot of them as a matter of fact. Oh, you may not know it but they are. They are questions that will be asked throughout the balance of your professional life – no matter what your occupation or educational pedigree. If you work alongside others how you answer them will go a long way in determining your success. And if others work for you – well, your answers will decide if others willingly follow you – or choose to leave you at the first signs of crisis. I invested just short of four decades in the corporate world. Now before you assume I’m ancient understand that was the whole of my professional career. I retired early to form my own consulting and leadership company. Today The Compass Alliance dictates a great deal of my time – and no subject seems to demand more attention – or more consternation from clients – than the sometimes ethereal subject of leadership. Kind of hard to believe, isn’t it? After all, what subject has been written about or discussed more? Few thoughts for you – first, authentic leadership is in VERY short supplyin the business world. Gallup estimates that somewhere around 15% – 20% of the typical organization’s leadership is the real deal – which means most of us are far short of the mark when it comes to making a difference in the lives of the people who work for us. Second, you may not like those numbers – most companies, and most senior leaders don’t. But similar Gallup data encourages us to check our employee engagement numbers – and the poor score attributed to those who manage – and your arguments are soon laid to rest. Third, the assumption that leadership is limited to those who manage people is terribly dated. All of us are potential leaders – either influencing effective organizational movement or becoming part of the problem. Some of the very best leaders I ever met NEVER supervised others – but they inspired followership – something more titled peers never could accomplish. Which takes me back to those questions I mentioned at the beginning of this blog. In my 6thyear of a career that exceeded 38 I began to study leaders – not just listen or admire them – but to study them. To seek to understand them. What distinguished the few from the masses? Were the real leaders just built differently? Did they think differently? Had they in some way been exposed to other great leaders in their formative years that changed them? And why was I inclined to follow them? For a long time I fell back on intuition – some just seemed to have an instinct others lacked. Until the day came that I began to appreciate it was because they answered questions for me that others couldn’t – or wouldn’t. And over the course of the decades that followed I codified those questions – and finally came to appreciate that the answers authentic leaders offered didn’t come in the form of their words – but by their actions. When I’m asked today to speak on the subject of transformative leadership I never fail to talk about The Five– if for no other reason than these simple questions have helped me to distinguish what separates the few from the many. I believe they are questions we all subconsciously carry when we look to others. And I know they are questions those around us have of us. The tricky part – the most articulate spokesperson in the world can’t answer them sufficiently. Only our actions can. Here then, is what people are asking about YOU. The message here is simple – if you don’t have some degree of street credibility that warrants listening to all the good intentions in the world matter little. If that high degree of merit isn’t balanced with a level of honesty – well, draw your own conclusions. Do you care about me? I worked with thousands – and can still intimately remember those who I knew who had my best interests at heart. I would fight to the death to support them – and I believe the feelings were mutual. The message – let me know I’m more than a number, more than an employee – and I’m far more inclined to align with you. Can I trust you? Amazing in the corporate world that so many don’t understand this simple concept – or are willing to sacrifice it for personal or business gain. I once worked with a brilliant supervisor whose loyalty to his people rivaled a gnat’s commitment to studying computers – nonexistent. Genius lost. The message – like a great marriage, trust sits at the core. Are you committed to a vision of excellence? Powerful – the few truly committed to a vision of what “could be” inspired others. In a world where everyone knows the right words authentic leaders “walk the talk” – constantly moving toward the shining city on the hill – and by their passion, pulling others along with them. The message – we all look for the why behind our work – not just the what. Truly inspirational leaders point the way. Can you help make me better? I used to think this question was specific to supervisors and managers. Boy, was I wrong. The most influential peers do more than make the company successful – they make YOU better. I never worked alongside a truly great co-worker who didn’t help transform me. The message – influencers come into our lives and they leave a mark. Sometimes we don’t realize his or her full impact for years but show me a truly transformative leader and I will show you someone who changed your career trajectory – guaranteed. Five simple questions – but in a world becoming more and more transactional so VERY powerful. I’m a work in progress but my answer is this. First, transactional leadership is a contradiction in terms. It doesn’t exist and never will. Transactional management does exist and we see it in excess everyday. Quid pro quo – you do this and I reward you- action dependent on payment (or restitution.) Most companies depend on transactional management – it’s the next best thing to leadership I guess. Transactional managers affect the hands and feet. But transformative leaders – those talented few who can answer in the affirmative the questions above – inspiring others to willingly follow – they affect the heart and the head. 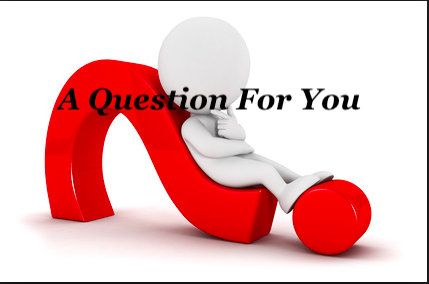 Those questions others are asking about you – what’s your answer?